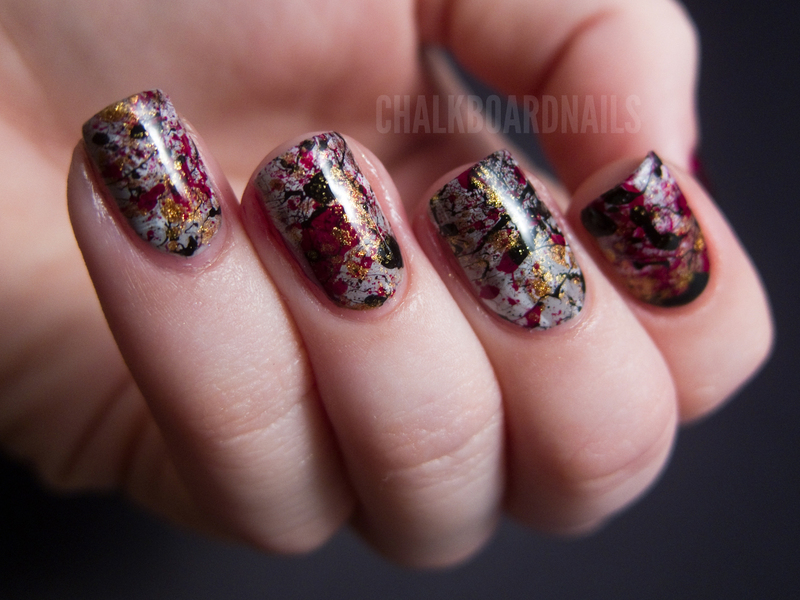 Fashion Polish: Guest Post : Sarah from Chalkboard Nails rocks a mind blowing splatter mani! 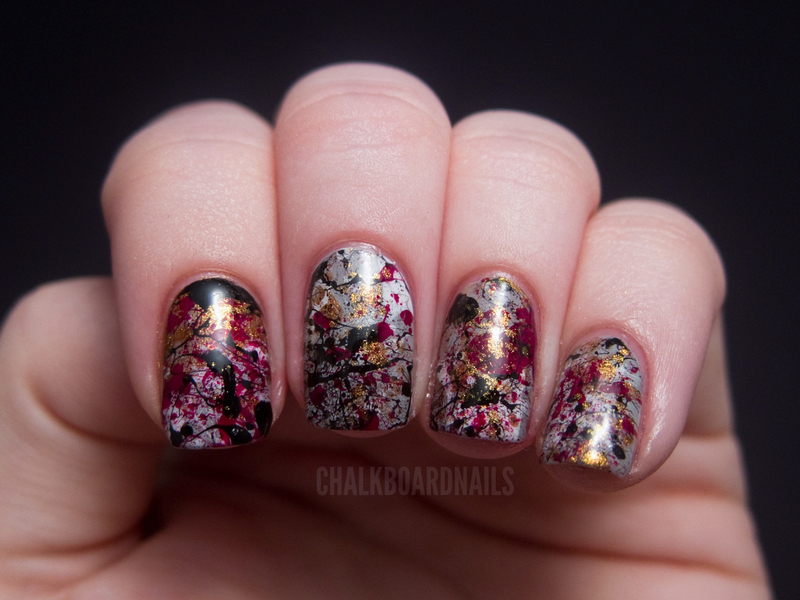 Guest Post : Sarah from Chalkboard Nails rocks a mind blowing splatter mani! One thing I consider essentiel as a nail polish blogger is to have good photographing skills. I'm not talking about exposure, white balance or other technical settings but about figuring out how to place your hands or how to play with light. Sarah definitely knows all about that with a BFA in photography! Here's her beautiful creation. Hello everyone! I'm Sarah and I am the blogger behind Chalkboard Nails. I am really excited to be guest posting here on Sam's blog, and decided to do one of my favorite techniques: the splatter manicure! Splatters are fun yet dramatic, and always crowd-pleasing... but MAN are they messy! Polish goes everywhere, clean up on your nails takes a lifetime... but I think it's worth it, don't you? For this particular look I started with a base of Zoya Dove, a light grey creme. Then, I carefully taped off the skin surrounding my nails, covered a wide area with wax paper, and began to splatter! It's a pretty simple process. All you need to do is cut some drinking straws in half, dunk them partially into a bottle of polish, and then blow the polish on to your nails. I find that shorter, faster puffs of air give a better splatter effect. If you don't blow the polish through the straw fast enough, you can end up with big huge globs of polish on the nail (not cute!). I started by splattering on China Glaze White On White. 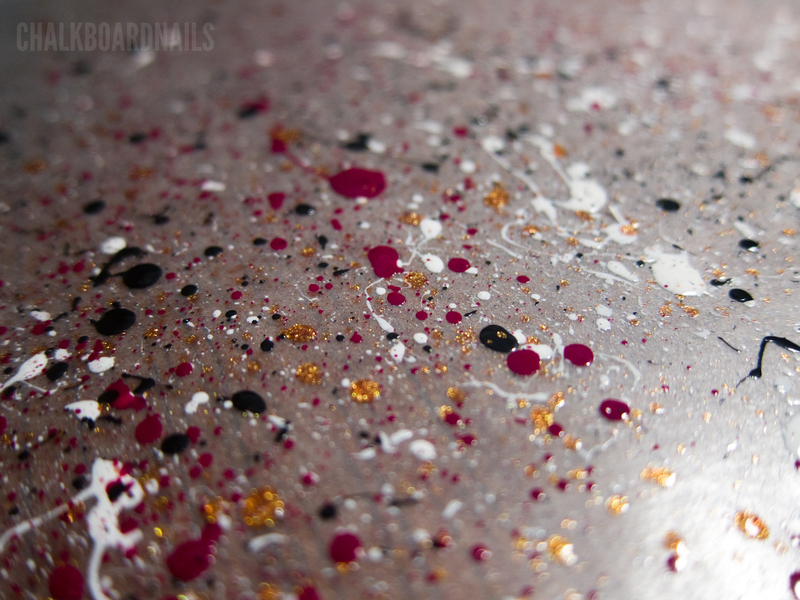 Then, I chose OPI Legs Celebrate, which actually ended up looking like gold leaf on the nail when splattered on! Next came OPI Manicurist of Seville, a vampy red. I finally finished off the look by splattering on Urban Outfitters Eyes Wide Closed, which just happened to be the first black creme I grabbed. In my opinion, including either black or white in any splatter manicure is a must! It really makes the whole manicure look finished and makes it pop. Then the real work begins -- cleanup! The job is made much easier by the tape I put on my fingers beforehand, but Q-Tips and a makeup brush in polish remover help to finish up any areas that the tape couldn't block. This part takes patience, but your nails deserve a little lovin'! I really like the final result of this. My nails kind of remind me of Dracula living in his castle. The grey is the stone his castle is made out of... the white is his skin, the black his hair. The gold is the castle treasure, and the red is his dinner, obviously! :) I didn't set out with intentions for my nails to remind me of Dracula, but I'm not complaining. The splatter is moody and I can dig it! 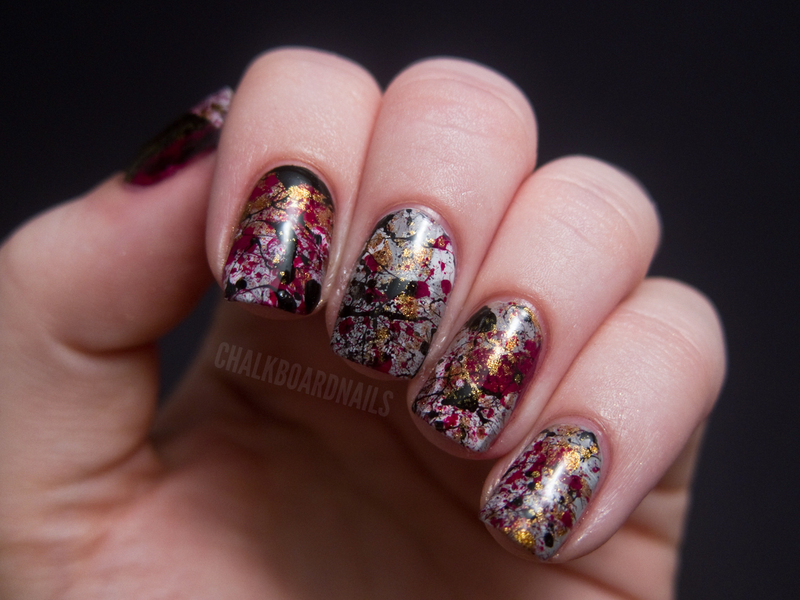 I hope you enjoyed this manicure, and thanks to Sam for asking me to participate in her guest post series! To visit Chalkboard Nails, you can either follow the link or click on the image below. Thank you for visiting girls! Great choice of colours indeed! This is an amazing look - the gold really sets it off! Wow, that's a really stunning combination. And how original - I never ever would've though of it! This looks superrrr awesome! Gotta try that someday! Probably the best splatter mani I've seen so far! LOVE it so so much! she is amazing and this is no exception. amazing. Wow it is so beautiful and awesome <3. Nice guest post Sarah! Probably the best mani of hers I have ever seen. MUST TRY! This one is so so awesome! Still have to try it myself sometime. This came out so beautiful. The combination of all the colours is just stunning! WOW! For never trying a spatter mani - you hit the jackpot out the gate on your first try! This is amazing looking. Love the colors. It looks like a Jackson Pollack! Love the suggestion that pn said - using those smaller coffee straws! That looks incredible and I love the clarity and style pf the photos! WOW, I love this!!! Beautiful work!!! I love these colors together, they remind me of Japanese art, or kimono colors. LOVE Sarah's mani's - the combo of this splatter is amazing and not of the norm, what I love about her style!